This map's plot is straight from Schwarzenegger's movie 'Sixth Day'. Anyway Duke fights against his clone and this clone can be another player or a bot. 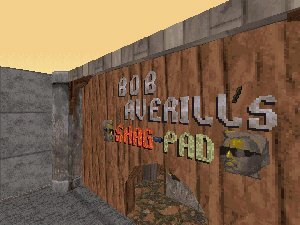 Bob strikes back with his second Dukematch map which is a nice surprise while waiting for his third hit file 'Bobsp3'. Level is located on an island with rocks, plants, ponds etc. Ground and rocks are awesome detailed and there are many size of them. Ground is also filled with some kind of a grass. Water is again clear (Bob's very own effect) but it's bugged. Design is of course detailed. Map is just very short with only two areas (another is very small). That's good because I just love all small Deatmatch maps especially those in Quake3Arena. It's recommend to play against only one player or bot (to fit with storyline and plot). It also looks like Bob loves those midis in 'Platoon TC' because this one has too a midi from it. It fits well in these Bob's battle areas. TXT file is also recommend to read completely because it has some nice jokes. You'll also find out that this map is located in Duke's dreams between Bobsp1 and Bobsp2. Anyway gameplay feel is very good and fighting against a bot is highly recommend. Pascal's 'Dukeroch' program is also recommended to launch the map easily with bots (available in 'DmMaps' section's main page).